So are we at high tide or low tide? Fossil records show Biodiversity comes and goes in a 62 million year cycle. The analysis, performed by researchers with the U.S. Department of Energy's Lawrence Berkeley National Laboratory and UBC, has withstood thorough testing so that confidence in the results is above 99-percent. Please don't let this image distract you from the quality of the FPP. Hmm. So, ah, where are we in this cycle? Interesting. I remember that for a while there was a theory that the dinosaurs' extinction was part of a cyclical pattern of mass extinctions due to a distant dim star / planet periodically perturbing the Oort cloud. I think it went out of favor because it was too hard to match up the data on actual extinctions with an cyclical pattern. From the graph they leave the last 50 million years blank, but it appears we've got another 14 million years until we hit their next cycle. Very, very interesting. Pity it has such a limited data set (multicellular marine animals, at the level of genera), but I guess there's not much you can do about that. What interests me is the way there appears to be smooth humps in diversity - I'm used to thinking about biodiversity in terms of mass extinctions and rapid radiations, rather than smooth fluctuations. What event, from 225 - 200ma, could cause such a smooth decline in biodiversity? It's important to remember that productivity / resource availability / a "good" environment don't necessarily correlate with high biodiversity, from an ecological perspective. "Poor" conditions can result in species differentiation and an increase in biodiversity. "What were seeing is a real and very strong signal that the history of life on our planet has been shaped by a 62 million year cycle, but nothing in present evolutionary theory accounts for it, said Richard Muller, a physicist who holds joint appointments with Berkeley Labs Physics Division, and UC Berkeleys Physics Department. While this signal has a huge presence in biodiversity, it can also be seen in both extinctions and originations. Ahh...the repel bevets card...it does nothing! You really aren't that bright, are you bevets? I think I know what bevet's trying to say, though. It must be that God has, like, a 62 million year sleep cycle. Every "morning" when he wakes up he waves his wand and creates a whole pile of new molluscs and fish. When he goes to bed, though, all the little creatures die off because God isn't there to care for them anymore! Makes perfect sense to me. How about you? By the way, bevets, when was the last time you heard a creationist say "nothing in present biblical theory accounts for it"? You seem to think that because biology is a developing, living science, it's weak. A discipline where new discoveries are made and new explanations need to be found is healthy. A discipline where divergence from the norm is called "heresy" is dead and buried. Maybe I need to read the whole article but the graph presented doesn't seem to really have notches each 62 million years. Maybe its 62 million plus or minus 10. And it does look like the last one was 65 million years ago. Does someone want to plot this on to a grid and give the periodicity of the nadirs? Haha, the bevets card is great. Shame about the typo though. Rothko writes "(Given biodiversity usually follows mass extinction events...)"
Rothko makes an important point here: obviously, after mass extinctions, there will be a great many ways of making a living -- ecological niches -- no longer filled. Given that those specialized organisms that best fit those niches are no longer around to compete, those species that did survive have an opportunity to fill those niches even if they aren't particularly good at doing so. Let me clarify with an example: woodpeckers fill a very specialized niche and have a number of adaptations that make them good at drilling into wood to extract tasty insects. Were members of a species not so specialized to try to make a living in that niche, they'd almost certainly be out-competed by woodpeckers. So even if a particular group of -- for instance, bluebirds -- had a single mutation that led to pecking bark for insects, lacking the other adaptations of woodpeckers, like reinforced skulls, strong neck muscles, or a tail designed to brace against a tree, the mutated bluebirds would have little chance of succeeding at making a living as would-be woodpeckers. Since there's a cost to any adaptation, on average the non-mutated bluebirds, well adapted to the bluebird niche, and the woodpeckers, well adapted to the woodpecker niche, would both out-do the mutated bluebirds. And that would mean the end of mutated bluebirds. The mass extinction, as it were, clears the board, opens up a number of ways to make a living, and allows species inexpert at surviving in those niches time to adapt to them. So it's not, as Rothko points out, mere chance that biodiversity follows mass extinctions; instead, diversification is fostered by mass extinction. Indeed, we can go one better and say that biodiversity must logically follow form mass extinction: after the extinction, individuals of those species that survive still compete amongst themselves in their particular species's niche. Any mutation that tends to move an individual of that species out of his (still populated) niche into a newly vacant one, reduces the competition he faces, which makes it more likely he'll prosper. So the mystery here is not the biodiversity after the mass extinction, that's pretty much guaranteed by evolutionary theory. What's mysterious is only the mass extinctions themselves, and their regular cycle. What you're thinking of is the Nemesis theory, but it's pretty much dead anymore because the full-sky infrared sky survey would have detected anything like a red or brown dwarf anywhere in the vicinity. The nature of the object would be pretty obvious because it would be bright in the infrared wavelengths, but invisible or faint in the visible. Also, it would have a large proper motion. Since nothing like that has been discovered, it's very likely that Nemesis doesn't exist. Interesting. But, I think, explainable with a little thought. If the environment of the earth is changing at a relatively stable rate, stabilized by the cooling of the core or decay of various plentiful atoms for instance, and given that advantageous mutation occurs at a certain general rate (within a range), it doesn't seem unlikely that the two would interact and at some point climate change would overtake speciation and adaptation briefly, before the other catches up. I guess when you actually crunch the numbers it turns out to be about every 60 million years. Wow, BLF, that's interesting. But wouldn't natural selection keep the rate of adaptation pretty close to the geological change? I read once someone had found a 25 million year cycle and thought it might correlate to the rotation of the galaxy bringing us through a dangerous area every so often. On a purely speculative note, if a civilization had occurred during one of these previous cycles, would we even be capable of recognizing the fact? I read once that, if all humans died at once, it would only take 1000 years to wipe all traces of us from view. We are the current top dog (Douglas Adams notwithstanding), but with the ever increasing rate of technological change, we might not realize that the artifacts of our own descendants a few hundred years in the future are artifacts, much less recognize those of a culture a thousand years or a million years older than us from the past. In a May 1984 article called The Deadly Thing at 2.4 Kilo-Parsecs, David Brin uses the then current data to infer a mass extinction event every 197 million years, plus or minus 12 million years. He notes that this is suspiciously close to the 230 million year orbit the solar system has around the center of the galaxy. But not quite. However, suppose there is a deadly thing (such as a gama-ray burster or a large black hole with its jet of radiation aimed across the galactic disc) orbiting the galaxy in a smaller orbit. It would catch up with the solar system in its orbit, so it would draw close every 197 MYears instead of 230 MYears. Doing the math tells us that while the solar system is about 10 kiloparsecs from the center of the galaxy, the deadly thing would be at 2.4 kiloparsecs. Of course it has to be really deadly, since at closest approach it is 7 kiloparsecs away (about 23,000 light years). It is hard to imagine what could be that powerful, yet still undetected by astronomers. 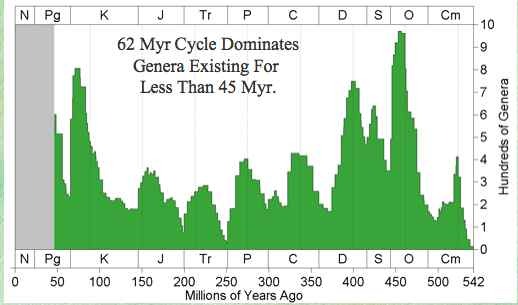 Now, this newly discovered cycle is only 62 MYears. This means the deadly thing has to orbit farther from the center of the galaxy, which means the closest approach is much closer than 7 kiloparsecs. Astronomically this is more plausible, since it could be weak enough to be undetected yet strong enough to cause mass extinctions. So the mystery here is not the biodiversity after the mass extinction, that's pretty much guaranteed by evolutionary theory. Can you suggest any possible observations that would pose a problem for evolutionary theory? Oh, man, now I gotta worry about some evil space jerk killing me too? There's no way 1000 years would wipe all traces of humans off the face of the earth. Consider the great pyramid. It was built in 2560 BC. 4565 years ago. We've found plenty of human made stuff older than that, too. This other night, God spoke to me and told me that evolution was a trick She made to fool the non-believers. It is hard to imagine what could be that powerful, yet still undetected by astronomers. That would mean that we're three million years overdue ... ?? Disclaimer: I have not read the Nature paper - but what troubles me is that the curves appear so guassian and that they match up so closely with the geological 'ages' that we have arbitrarily ascribed. I'm not convinced that this might not be an artifact of how we've defined geological ages and subsequently, how we have dated fossils. Of course, if this 62M yr cycle was true, then we could have ascribed geological ages correctly based on accurate dating of fossils. There are many, for example if mammalian fossils were found in cambrian rocks, or if the individuals of any species were shown to accumulate on average more than one lethal mutation per generation. Check out Talk.Origins for a very full explanation of evolution. If you want to talk creation v evolution, you will find the people at Creation versus evolution are a great deal more enthusiastic on the subject than mefites. Are these events too regular to be coincidence? It seems so, but are we really accurate in our dating of them? It's really weird. the curves appear so guassian and that they match up so closely with the geological 'ages' that we have arbitrarily ascribed. The ages are not arbitrary. They reflect the differences in the fossils found in different layers of stone, as observed long before accurate dating was possible. As an addendum to my previous idea - perhaps it is something like a tipping-point hypothesis - like, at a certain point, adaptations for an environment become useless in the new one. Or maybe around every 60m years there is an ecological tipping point, resulting in a lot of extinctions. We just had a big, long ice age, which probably ended a ton of life, and certainly they have happened before and probably worse - that's just one example of what i'm thinking of. apodo - that's what I mean. When fossils are dated, are they assigned a de novo date or are they dated more along the lines of "gee, this one looks a little bit more 'advanced' than this other one, so lets give it a [date of older] + [X number of years]?" Also, is our knowlege of earth's geological ontology sufficient to say that *this* layer of stone is X number of years old and *this other* layer of stone Y number of years old - or are the dates estimates? It's a very interesting finding, and I'm sure the researchers (and the reviewers at Nature) have addressed my skepticism, but I keep getting this nagging feeling that this might be an artifact dating back to the very beginnings of formalized paleontology. "Also, is our knowledge of earth's geological ontology sufficient to say that *this* layer of stone is X number of years old and *this other* layer of stone Y number of years old - or are the dates estimates?" "More" and "less" advanced, or "higher" and "lower" were terms Darwin himself deprecated; an organism evolves to fit its environment, not to become "advanced" just for the sake of advancement. Shark phenotypes are largely unchanged for millions of years, because shark phenotypes work so well for sharks and shark genes. So saying something "looks more advanced" is not only subjective, it's simply bad science. And it turns out that these changes that are "invisible" to selection also occur at regular intervals. So by counting the number of "invisible" mutations in two related species, we can get a more-or-less accurate date for when the two species last had a common ancestor. So yes, our dating is actually pretty accurate. Well, all dates are estimates. After all, we don't record the exact time with reference to an atomic clock in human history either. Rocks are dated according to the decay of certain isotopes into other isotopes. There is an error in measurement in that the chemestry can be tricky, but the underlying theory is consistent with observations we can make in other fields. I find creationism fascinating, much in the same way I find The Ashlee Simpson Show fascinating. Please explain the significance of this quote in relation to the article. Accepting one/several/many/cyclical catastrophes does not argue against the possibility of evolution/darwinism any more than it does prove creationism, so I am at a loss to the how this quote is relevant. I know you didn't post this, I only bring it up because I would like to know if you also believe in a young earth (one that is 6000 years old) and not in an old earth (one that is nearly five billion years old)? I'd rather hear your answer to this question than to the one I posted above.